When Hanumanthappa Koppad was airlifted from Siachen in a critical condition for treatment in AIIMS Delhi, the usual hawks like Arvind Kejriwal and Rahul Gandhi were nowhere to be seen. Both were absent from Delhi. While the former never got time to meet the Jawan as he was busy with some sundry nonsense somewhere in the country, the later was merrymaking in Europe as part of his regular vacation schedule. And please don’t laugh; these are the same people who now are shouting the most after an ex-serviceman committed suicide over alleged discrepancies in OROP. Irony couldn’t have died any filthier way than this. If the recent past alone is taken into consideration, both AK and RG stand culprit in showing the minimalistic respect for our armed forces. They are routine offenders. In fact most from the political parties they belong and virtually head, are in a bad habit of insulting our armed forces at the slightest opportunity. I have documented it in many of my earlier posts on how, given a chance, both these unscrupulous and dimwit buffoons would sell off our army to the highest bidder for personal and political gain. 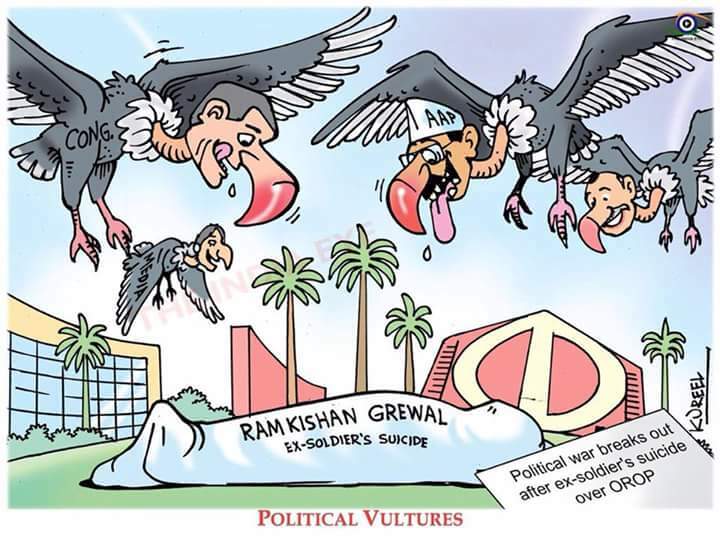 May be, Ram Kishan Grewal was not aware how his death would be feasted upon by vultures after his demise. 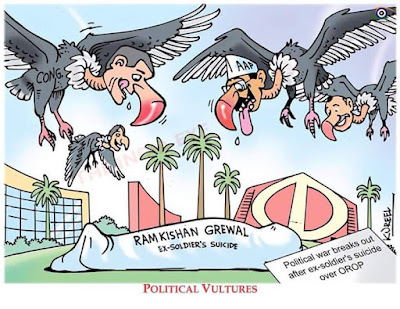 And as I said, the irony here – These are the same vultures that would be carrying the least of respect for people like Mr. Grewal and his colleagues when he was alive. 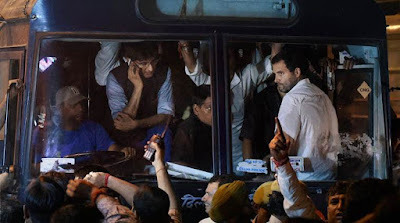 I time and again say – Rahul Gandhi needs a lot of education; starting with his own and his party’s history. Congress, post the advent of Indira Gandhi have a chequered past vis-à-vis Indian defence forces and as usual, a clueless RG would not be aware of this. Even if we let go the general history of the Congress party, which is nothing but full of rot, I am sure RG may not also be aware of his party’s history around OROP. Forget about the history around OROP, RG may not be aware of what ORP itself is. 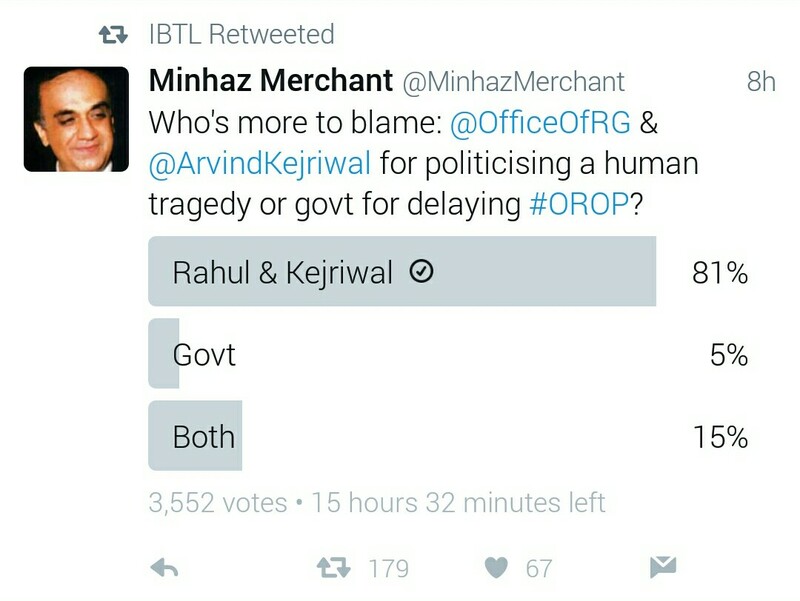 Though a dullard like RG may not understand a bit about OROP and what the fight is all about, it still can’t be absolved how a numskull like him is still given such a long rope to vilify sanctity at an alarming rate. This is surprising. So, it is again that time of the month where one needs to educate RG of few facts and how he should be ashamed of the past he belongs to. But, will he care to look back at the history? That said, I am still sceptical if this man would ever learn and I have reasons to say so. After being aware of his monumental gaffes in various forms in the past and his latest ‘Aloo Ki Factory’ jibe, I am not very hopeful of this man learning anything productive ever. But still, it is worth an effort if RG can be reflected upon the history that he is shameful enough to not only forget but also shout on various issues like a dumb. Here is the history around OROP if RG cares to know and most important, if he has enough brain to understand. I urge RG, while reading the deplorable history of his party and his family; he must also revisit his statement of ‘Khoon Ki Dalali’ and see where actually it fits the most. It was Indira Gandhi who scrapped OROP during her regime. The fight of our ex-servicemen is going on from that period. Needless to say, there were many governments, mostly of Congress, that ruled since then. Every subsequent government saw our agitating men in uniform for their rightful demand. For reasons known to none, no government ever thought to give a patient hearing to the demands, let alone fulfilling them. During the recent 10 years regrettable tenure of UPA alone, the OROP was rejected twice. This led to our war veterans returning their gallantry awards in 2012. Though Congress and RG were very vocal about the quack ‘Award Wapsi Gang’ and their wolf cry of intolerance, they never were bothered why our real heroes were returning their awards. Where has ‘Khoon Ki Dalali’ gone back then? This leads us to the first question - Where was RG and his over active vocal cord during that 10 years? I found a stupid Rahul Gandhi blabbering on every topic under the sun without an iota of idea on what he was talking but I never heard a single statement coming from this man on OROP. What has changed so dramatically inbetween? Please don't tell me that RG had an elevation in his IQ to a limit to finally understand what OROP is all about. That is simply not possible. 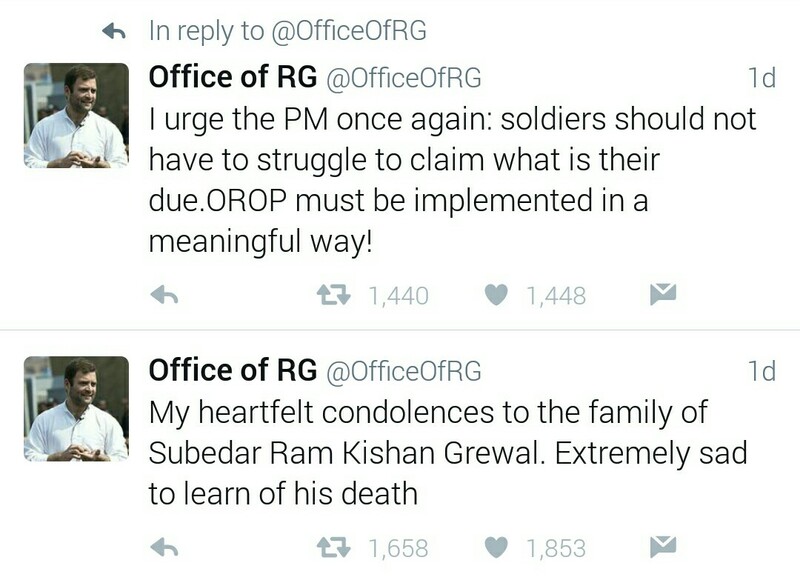 Suddenly today, the great man in RG has these concerns for our soldiers oozing out uncontrollably. His emotions have gone to such shameful low that he decided to not only repast on a dead body but also bring along all his sycophants to feast alongside him. This is some astounding moronery. It is only laughable looking at a person who never bothered while in power but is on the streets today with his bogus concerns. Shameless creatures like Digvijay Singh loitering around and giving the death a non-required lewdness is another low that RG advocates. Little did RG forget that he belongs to a party that questioned the veracity of the Batla House encounter and shamed a martyr. The widow of Inspector Sharma had to go to the courts to protect her husband’s pride. Father of Capt. Saurav Kalia had to run from pillar-to-post to make the useless UPA government acknowledge his son a martyr but failed. Where was RG then? Killing his time in Milan or was taking a Thai massage? Crime of Congress in degenerating our armed forces in general and martyrs in particular draws a long list. It almost runs to infinity. They didn’t even leave a gruesome episode like 26/11 from their communal overtone. And now these are the same people who are shedding crocodile tears for an ex-serviceman. Has these vultures left with any shame or they have already parcelled it to Italy in instalments? Talking about ‘Khoon Ki Dalali’, it makes me turn a page from the book called ‘Congress Moronery’ and urges me to go the chapter titled ‘Rajiv Gandhi’. Does this moron RG remembers something called IPKF? Is he aware how many of our soldiers died because of the fancy of an idiot, who instead thought to become a peacenik? I personally have met a lady whose son got killed in IPKF operation and how I wish RG meets this lady someday to check the facts on the ground. Just because Rajiv Gandhi had to oil-wash his alter ego and prove himself as a great leader in the region, he not only poked his stale nose in internal matters of another country but also let hundreds of our soldiers die a death they never deserved. With such an awful bogie of rot to hide, the Irony that, the duffer crawling at the bottom of the Nehru-Gandhi barrel is now throwing his upheaval in a manner that would make the word ‘Bastardization’ sound like a minor. 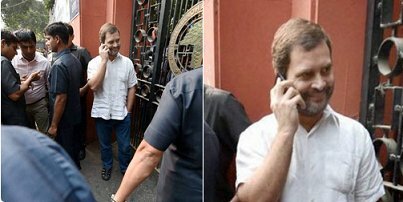 I call RG’s acts more than just bastardization because his brazen smile while protesting gives away a lot on what this joker means with his concerns. Lest we forget who architected Bofors, the first mega corruption involving our Defence system. I guess it doesn't require much elaboration here. But it is not RG alone in the competition. There are many who can smell dead like the hyenas. Arvind Kejriwal could easily be the leader of the pack. He visited Dadri but never could find time to visit the slain doctor from his own backyard Delhi who was murdered by the goons belonging to the religion of peace. He never visited Hanumanthappa but flew business class to join the Rudali gang of Rohit Vemula in Hyderabad. AK is a seasoned vulture and he had proven it in more than one occasion. Cartoonists generally don’t miss the truth. In fact AK is in a competition with RG to prove who could cry the loudest. Only a couple of days back, AK was vehemently questioning the Bhopal encounter and making a mockery of the death of a police guard. While fighting Delhi elections AK’s AAP put it in their manifesto to reopen the investigation on Batla House encounter. AK was the one who used the name of Capt. Vikaram Batra for his political benefits in Hamirpur. Like RG, AK’s crime in sabotaging the pride of our men in uniform draws a very long list. Almost every day this guttersnipe of a character goes about insulting our soldiers. He was head-over-heels in proving our DGMO and army as liars after Uri surgical strike, so much so that he tuned his shenanigans with our enemies. Like RG this man’s dishonesty towards what he says and what he practices are legendary. A suicide in isolation now becomes a howling point for this man while, not a log ago, he allowed a man to commit suicide during his own political rally. Not only that, he let loose a scumbag called Ashutosh to cry like a whore on national TV. But then, AK and his trademark fraudulence have a pattern that no more requires any eloquence. Though a crying Ashutosh urged all not to telecast the clipping of the suicide in AK’s rally, now this moron is busy rewetting everything that contains the mere mention of the audio tape of Mr. Grewal before he committed suicide. How that pans out? Let’s check the facts. And, it certainly isn’t what Rahul Gandhi and Arvind Kejriwal want you to believe. They are liars and opportunists. As mentioned earlier in the post, no government ever bothered about the veterans. It was the present Modi government which acted on this long pending demand and rolled out OROP late last year. There could be and there are few anomalies. A matter spanning over 35 years can’t have a picture perfect model in its first version. This is what is proved from the tweet of Rahul Kanwal, the Johny-come-late in the secular brigade. 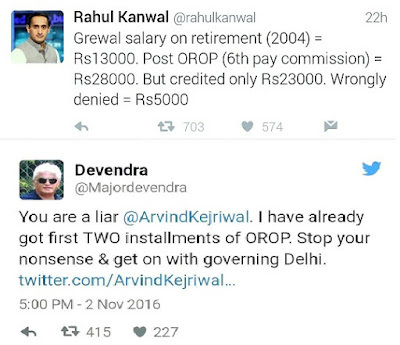 Mr. Grewal had Rs 13000/- as pension before OROP which in a way reflects what he was getting during UPA time. Post OROP his pension has been increased to Rs 28000/-. Did the hawks worming around the dead body not aware of this differential amount? Now it is alleged that Mr. Grewal committed suicide because there was an error of Rs 5000/- that is credited to his account. Seriously? Is it believable that someone will take his life just because of 5K? If so then as correctly said by Gen. V.K. Singh, Mr. Grewal’s mental condition needs to be studied. To even make it more interesting, he wasn’t poor either. He was a Sarpanch with good savings in his account. It is a different matter that the Congress morons are blabbering if someone points out how he became Sarpanch on a Congress ticket but that is a fact. That is not all from his political life. If it is true, Mr. Grewal is been accused of corruption and loot in the MNREGA scheme and is being investigated of the same. Honestly, I feel ashamed to call him an ex-soldier. Cowards commit suicide not heroes, which these vultures are trying to prove the other way. Mr. Devendra is dead right here, even though he didn't reveal anything new. AK is a liar and we all know it. There is no reason why I should believe a proven liar like AK over Mr. Devendra. 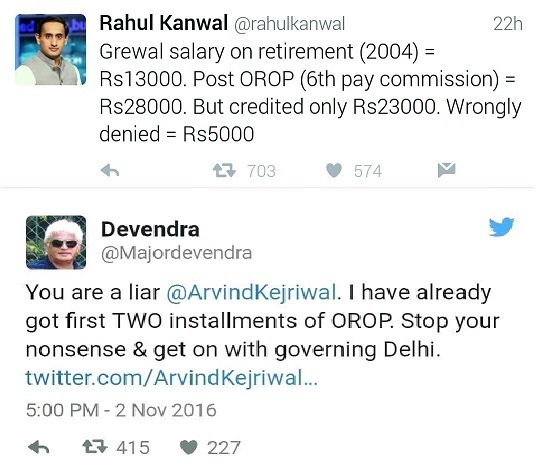 As per him he already has got his first two instalments of arrear in OROP. What are the sources of AK that tells him that OROP hasn’t been implemented yet? Knowing AK and his rotten politics of ‘shoot-and-run’ it is highly probable that he is bluffing yet again. But people aren’t fool anymore. Now they are seeing through these opportunist morons. The online voting reflects so. People in general know who the real culprits are and who have made a business out of a human tragedy. Not a single politician of this crying lot had time to attend the funerals of Uri martyrs. Forget about attending, they never even had time to visit the grieving families for once. But look at the change now. These are the same felons who today are falling over each other to do a photo-up at the last rites of Mr. Grewal. AK already have declared him a martyr. That is not all. He also have announced 1 Crore booty for his kins. That is one hell of an idiocy. Someone is coward enough to commit suicide and he becomes a martyr in AK’s world while till date they disagree to include Bhagat Singh in the official martyr list. Uri martyr Gangadhar Dolui’s father borrowed Rs 10000/- from his neighbours to cremate the braveheart because he was offended by the treatment of Mamata Banarjee government. He was offered only 2 Lakhs as compensation, the same amount which was paid as ex-gratia for hooch tragedy victims in West Bengal. Brilliant!! The sacrifices of a martyr is equated with a bunch of wags that died of illicit grog. This can only happen in India and specifically with these moronic politicians. And as it is, Mamata Banarjee is a different case study altogether. Facts withstanding, it only would require unbelievable shamelessness, which I am sure Derek O’Brein possesses in plenty, to cry alongside other vultures. They shame the soldiers back home but preach nonsense in the national capital as if no one is aware how bad manipulator of facts these scumbags are. I am sure; these opportunistic idiots are heading towards disaster. They are reduced to 44 because of their dishonesty and charlatanism and I am sure they would be reduced to naught in due course. And I believe they deserve to be wiped out from our political discourse for good. Hope, a thrashing of a response awaits these jerks when they next come begging for votes. Bloody skunks! !